Posh star Marcus Maddison is crowded out by Scunthorpe players Neal Bishopp and Murray Wallace. Photo: Joe Dent/theposh.com. 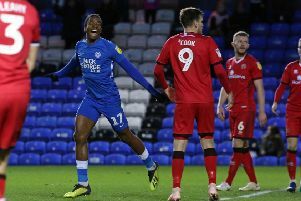 Peterborough United manager Grant McCann described tonight’s (November 22) home defeat at the hands of League One leaders Scunthorpe as a ‘mini-blip’. McCann accepted the 2-0 scoreline was a fair result as his side’s run of three straight League One wins - and five wins in a row in all competitions - came to an end against the best side in the division. Tom Nichols of Posh tries to charge down a clearance from Scunthorpe's Charlie Goode. Photo: Joe Dent/theposh.com. McCann resisted the temptation to tinker with his starting line-up following Saturday’s (November 19) bruising derby win at Northampton Town, but his players lacked energy during a disappointing first-half performance. Kevin van Veen and Neal Bishop scored the Scunthorpe goals on 21 and 82 minutes as Posh dropped a place to sixth. “We had to start the first half as we started the second-half,” McCann stated. “We might then have had a chance, but we gave ourselves little chance with the way we played before the break. “We seemed to lack energy and tempo. We looked lethargic and Scunthorpe showed exactly why they are top of the league. Everyone of their players worked their socks off for the team and that’s a credit to their manager. It wasn’t just one or two of them it was all 11. Neal Bishop bundles home Scunthorpe's second goal. Photo: David Lowndes. “I didn’t learn anything because I already knew that everyone putting a shift in every game is the only way to be successful at this level. “We had a go in the second-half and we enjoyed some pressure for 20 minutes or so, but we didn’t deserve anything from the game. The final scoreline was a fair reflection of the way the game played out. “We toyed with making changes to the starting line-up after such a tough derby game on Saturday, but we had been playing well and winning. No-one wants to come out of a winning side, but that isn’t why we lost. Scunthorpe didn’t make any changes either, but they looked a lot fresher than us. “We had a couple of chances for Michael Smith and Tom Nichols after we made a couple of substitutions, but we didn’t test their goalkeeper enough. Marcus Maddison sent in some good crosses as well, but we couldn’t quite get the right touch on the ball. Posh striker Shaquile Coulthirst hits the deck after a tackle. Photo: David Lowndes. “It’s always disappointing to lose at home, especially after some good form, but it will be a mini-blip. We have bounced back from defeats well this season and I will make sure we do so again. Posh will have to play at Boundary Park without centre-back Jack Baldwin who will serve a one-match after picking up a fifth caution of the season tonight. Either Michael Bostwick will be moved back into the back four or Ricardo Santos will get his first start in a League One match this season.